Ronda Rousey is set to main event WrestleMania 35. 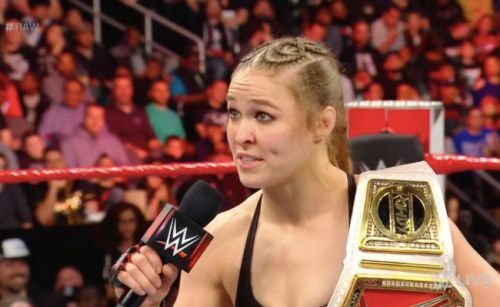 Ronda Rousey has been one of WWE's breakout stars of 2018. She stole the show in her WrestleMania debut and since then she has not been pinned or submitted. As a part of Monday Night Raw, she defeated the likes of Nia Jax, Alexa Bliss, Alicia Fox, Mickie James, Ruby Riott, Charlotte Flair, Tamina, Natalya, Sasha Banks, and Bayley while also holding the Raw Women's Championship. She is set to defend the Raw Women's Championship against Charlotte Flair at WrestleMania 35 and it is becoming increasingly likely that Becky Lynch is re-added to the match. This match will almost certainly be the main event of WrestleMania 35. However, it has been heavily rumored that Ronda Rousey will be leaving WWE for a while now. It is now reported that the Baddest Woman on the Planet will be finishing up with WWE at WrestleMania 35 after presumably dropping the Raw Women's Championship to Becky Lynch or even Charlotte Flair. However, it is extremely unlikely that this will actually happen due to a multitude of reasons. #3 A number of potential dream matches for Ronda Rousey. Will we actually never see a dream match between Ronda Rousey and Becky Lynch? 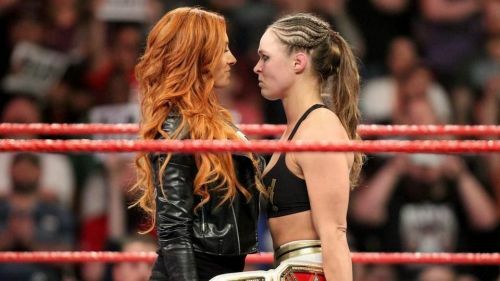 If WrestleMania 35 is Ronda Rousey's last match, there are a number of dream matches between the two women that we will never be able to see. While Ronda Rousey has faced a number of the members of WWE's women's division, there are still several opponents that she has never faced. There is a lot of potential in dream matches between Ronda Rousey and Asuka, Sonya Deville, and Ember Moon. That's not even counting potential matches with NXT and NXT UK superstars including fellow Horsewomen Shayna Baszler, Kairi Sane, Io Shirai, Mia Yim, and Toni Storm. That is not to mention the idea of a money singles match between Ronda Rousey and Becky Lynch which we must see at some point. It would also be cool to see potential rematches including Ronda Rousey against Sasha Banks, Charlotte Flair, Bayley, and Natalya. Since Ronda Rousey truly loves working with WWE, she probably wants to face the best opponents that she can face.